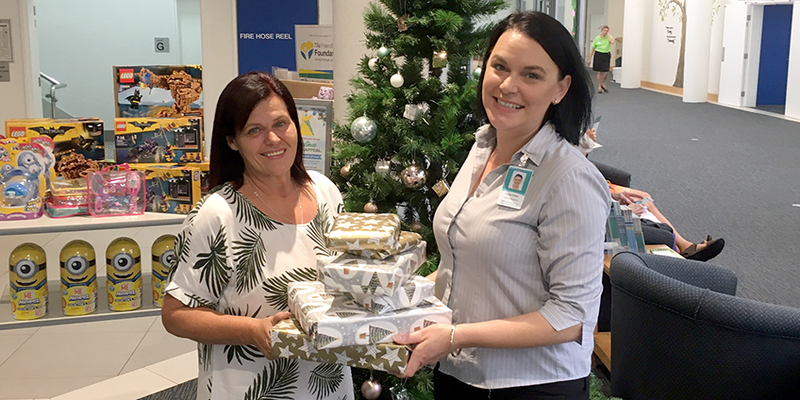 A special Christmas Partnership between two local charities and a goods giving program will enable $6000 worth of new toys to be delivered to Bundaberg families in need this Christmas. This year, The Friendlies has joined with Angels Community Group, after being impressed by the work the charity is already doing in the community. The Friendlies Foundation Public Relations Officer Tunja Cottier said the hospital had donated some kitchen goods to the group earlier in the year and were happy to offer their support to the group for Christmas Giving. “This year The Friendlies Foundation has been fortunate enough to secure $6000 worth of new toys, thanks to Good 360,” Ms Cottier said. “They are an amazing group who secure donations of new toys, and offer them to other charities and not-for-profits at a small cost of shipping. Ms Cottier said The Friendlies was now launching a Christmas Giving Campaign and asking people, including staff, customers, visitors and patients, to donate non-perishable food items, or grocery vouchers, to be donated to Angels Community Group that will be made into Christmas Hampers. The Friendlies is also taking a collection for the Group’s annual School Backpack Program. Angels Community Group’s Sue Tasker said with school starting so close to Christmas, a lot of families struggled with the extra expense so soon. “We put together a backpack with lunchbox, water bottle and basic stationary, which is universal to every school child and just offers that little bit of help so parents can focus on uniforms and stationary that is needed,” Ms Tasker said. The Friendlies will be taking collections of new lunchboxes, water bottles and vouchers from stationary supply stores alongside their Christmas campaign. Donations can be made at The Friendly Society Private Hospital and at the Friendly Society Pharmacy at Barolin Street from now until Christmas. Established in 2015, Good 360 has delivered more than $4M worth of goods to Australian Charities. Good 360 is a charitable organisation that offers a range of goods from office supplies to kitchenware and brand names toys. Charities and not-for-profits can become a member of the organisation to access a range of products through their online “Shopping” catalogue and pay only for the delivery to have the goods shipped to them.